A design that has been proven in every modern U.S. Military conflict where the M4/M16 rifle has been used. This G.I. style magazine is built to exacting standards by the (formerly Labelle) D&H company and has a standard 30 round capacity for the 5.56x45mm round. The Teflon grey finish is a secondary protection and is there to improve the reliability and ease of use of the magazine. Underneath this durable Teflon finish there is a stamped, ribbed and welded magazine body that has been anodized after being heat treated for durability to the military specification. This is paired with a fantastic spring that is made from 17-7PH that gives incredible weatherability and reliability. The floorplate is removeable for easy cleaning and the magazine features a high quality anti-tilt follower to ensure accurate feeding and the ultimate in reliability. 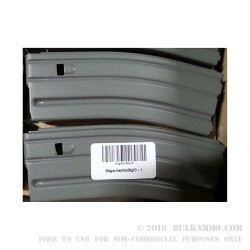 Capable of being used in any standard magazine accessory carriers or pouches and used with any aftermarket add-ons like bumper plates or other enhancements, these D&H magazines are hearty and durable in their own right. You can expect years of flawless service with these proven magazines.